By Janel Davis, Willoughby Mariano on Tuesday, October 23rd, 2012 at 4:38 p.m.
President Barack Obama and former Massachusetts Gov. Mitt Romney square off during their third presidential debate, which took place in Boca Raton, Fla.
Below are abbreviated versions of fact checks on statements by the candidates during the third debate. Look for the complete fact checks at the PolitiFact online sites. President Obama: Said former Massachusetts Gov. Mitt Romney was clear that he "would not provide government assistance to the U.S. auto companies, even if they went through bankruptcy." Obama repeated his claim that Romney would have let General Motors and Chrysler fend for themselves as they went through bankruptcy. In 2008, Romney wrote a now well-known New York Times op-ed called "Let Detroit go bankrupt." "The federal government should provide guarantees for post-bankruptcy financing and assure car buyers that their warranties are not at risk," Romney wrote. Romney’s term "post-bankruptcy financing" can have two meanings. It can refer to money used during bankruptcy and money used right afterward. The distinction has great practical significance in this case, because without the loans in the middle of a bankruptcy, there might be no automakers to lend to on the other side. Romney’s words were vague and quite limited in number, but he did speak of a government guarantee, and that would be the case whether he meant for loans during or after bankruptcy. We rated Obama's statement Mostly False. Mitt Romney: Under President Barack Obama, middle-income American families have seen their incomes decline by $4,300 [a year]. 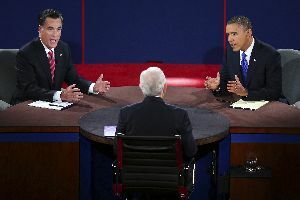 Romney repeated this claim during the debate to underscore his criticism of Obama’s failed economic policies. "The policies of the last four years have seen incomes in America decline every year for middle-income families, now down $4,300 during your term," Romney said. "Twenty-three million Americans still struggling to find a good job." The Romney campaign initially made a similar claim in an attack ad that under Obama families "have lost over $4,000 a year in income." That figure comes from a new but well-respected index created by Sentier Research, which tracked a decline in the median family income from the month Obama took office through June 2012. It’s tricky to compare that data with census data because they represent different time periods. But where it is possible to compare Sentier with the census, the results are within a few dollars of each other. But the economy was on a downward track before Obama took office, and a president has limited control over those forces. To the extent he should be held responsible, the slow recovery has all been on his watch. Romney’s ad cites trustworthy figures but oversimplifies the issue by assigning blame to Obama. We rated Romney’s claim Half True. President Obama: "Veterans’ unemployment is actually now lower than (the) general population. It was higher when I came into office." Obama used this claim Monday night to show that he has worked to successfully get unemployed veterans back to work. We looked at data compiled by the Bureau of Labor Statistics. We focused on two categories -- all veterans, as well as those who have specifically served in the post-Sept. 11, 2011, armed forces. Unemployment for all veterans was lower than the general population in January 2009 and remained so in September 2012. Those who served after 9/11 were unemployed at a higher rate than the general population in January 2009, and remained so in September 2012. Obama gets the formulation half-right. We rate his claim Half True. Mitt Romney: "I went to the Olympics that was out of balance, and we got it on balance." Romney reminded viewers about his role in the 2002 Winter Olympics once again during Monday’s debate. He took the helm of the Salt Lake Organizing Committee in the aftermath of a bribery scandal. The games had two budgets. The privately-run Salt Lake Organizing Committee used money from sources such as television rights to fund the operational costs. Under Romney’s stewardship, the budget ended up with a surplus. A second pot of taxpayer dollars paid for transportation upgrades and security costs. Romney helped secure at least $400 million -- and possibly up to $1.5 billion – of these funds to subsidize the Olympics. Romney’s statement was correct but could use additional clarification. He earned a Mostly True. Mitt Romney: "The president said he was going to create daylight between ourselves and Israel." Romney made this claim during Monday night’s debate to give credence to his criticism that President Barack Obama doesn’t hold the Jewish state in a tight enough embrace. The "daylight" comment stems from a July 15, 2012, story in the Washington Post about a meeting Obama held in 2009 with several Jewish leaders. The meeting was closed to the press, and there is no transcript of what was said. The Post story was based on interviews with people in the meeting. That said, Romney is fairly characterizing a quote attributed to Obama, which the White House has not denied. We rate Romney's claim Mostly True. President Obama: Said Romney called Russia our No. 1 enemy. Obama used this attack during the Democratic National Convention. Romney didn’t use those exact words, but he did refer to Russia as "without question our No. 1 geopolitical foe" in a March 26 interview on CNN. Romney later softened his language, calling Russia our "No. 1 adversary" in terms of UN votes. He emphasized it’s not the kind of enemy that launches missiles at American shores. That’s an important clarification, but it took five months to make. We rated the statement Mostly True. Mitt Romney: Said as president, Obama has never visited Israel. Romney repeated a claim first made during a campaign ad in August following his trip to Israel. Romney said that Obama has not been to Israel "as president," and that assertion is correct. The Washington Post’s Fact-Checker examined the archives of the historian’s office at the U.S. State Department and found that seven of the last 11 presidents (dating back to Harry Truman who was in the White House when Israel was established) never visited Israel. Democratic Presidents Jimmy Carter and Bill Clinton were the only ones to visit during their first term. George W. Bush went to Israel twice during his last year in office. That historical context is noteworthy. But the Romney ad’s claim is still accurate. We rated Romney’s statement as True. President Obama: Said Romney wants to add $2 trillion to the defense budget that the military hasn’t asked for. Obama has repeated this claim in each of the presidential debates. Romney lays out his national security policy on his website. There, he warns that restoring the military "will not be a cost-free process," and says he will "begin by reversing Obama-era defense cuts ... with the goal of setting core defense spending — meaning funds devoted to the fundamental military components of personnel, operations and maintenance, procurement, and research and development — at a floor of 4 percent of GDP." The Pentagon’s budget is expected to run in the range of 3.2 to 3.5 percent of GDP in the next fiscal year. According to the Center for a New American Security even a gradual ramp up to 4 percent would increase defense spending by $2.1 trillion over the next ten years. Independent analysts confirm Obama’s stated $2 trillion figure, and Romney did not deny it. Mitt Romney: Said Barack Obama began his presidency "with an apology tour." Mitt Romney repeated a charge he’s made before: that Obama has traveled the world apologizing for America. Obama's speeches contained criticisms of past U.S. actions. But he typically combined those passages with praise for the United States and its ideals. He frequently mentioned how other countries had erred as well. We found not a single, full-throated apology in the bunch. We rated his statement Pants on Fire. President Obama: Said Romney’s comments indicated he would "not move heaven and earth" to get Osama bin Laden. This charge comes from and ad that cites Romney’s statement that, "It's not worth moving heaven and earth and spending billions of dollars just trying to catch one person." Obama is right that Romney used those words. But by cherry-picking them, it glosses over comments describing his broader approach. Romney said he wanted to pursue all of al-Qaida, not just its leaders. Romney has been clear that he would prefer to participate with allies rather than take unilateral action to kill terrorists as Obama supported — and later did. The statement takes Romney’s words out of context. We rated it Half True. Obama repeated this claim Monday night from an attack ad on Romney. If picking a company makes it yours, then these were Romney’s companies and in a general sense, they did what he expected them to do. The one caveat is there is a gray area of direct accountability, because no one has reported that he was personally involved in managing those firms. We find little evidence that the particular firms were "pioneers in outsourcing." The Obama campaign took the word from the Washington Post but used it as its own. Outsourcing was well established by the early 1990s, and firms like Bain Capital were applying it in a variety of industrial areas. The Obama campaign's statement would have voters believe that Romney played a key role in driving the outsourcing phenomenon. We find that an exaggeration. We ruled the statement to be Half True.